But it's really much Cooler than that. Last October, quizzical passersby stopped several times a day at the building site at 416 Guerrero St. to ask and ogle. What, they wanted to know, was the story with the structure that looked like a giant Styrofoam cooler? The house being built was part of builder Bruce Turner's new green thumb. Within the last year, clients requesting sustainable building practices have encouraged Turner to turn over a new leaf. He attended the National Green Builders Conference last year and has recently adopted new environmental building practices at his company, which include recycling used building materials, employing passive solar design and minimizing erosion at job sites. He's also begun employing some unusual materials. On Guerrero Street, he's building a house with walls made out of foam blocks. On Nevada Street in Moss Beach, he's doing a major remodeling that includes counters made from crushed bottles, insulation created from old newspapers, and floors of bamboo and recycled rubber. "My clients are demanding this," Turner said. "You get so standardized, it can be hard to break habits and do things differently. this is a new way of thinking." The walls of the Guerrero Street home are made of a thin layer of concrete sandwiched between thick foam blocks so white they are blinding when the sun comes out, according to workers on the site. ":It looks kind of peculiar now, but it will take shape and look just like a normal house," production manager Skeeter McKitterick said. The foam may not look very sturdy - one can chip off a piece with just a fingernail - but it is far more durable than wood, according to McKitterick. It is resistant to fire, termites and the dry rot that bedevils coastal homes. Turner's client requested the foam because of its insulation ability. it can reduce energy bills up to 70 percent, according to the manufacture. 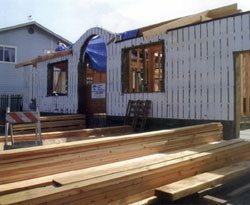 In Moss Beach, Turner is assisting with a remodel using entirely sustainable building methods. Client Janine Miller said she wanted to be mindful of the environment, so she spent hours researching the best materials. Her kitchen countertops, mosaics of shimmering green glass, are made from used Chardonnay bottles. The counter in her bathroom is recycled windshield glass. The floors are made from bamboo, which is actually a grass and replenishes much faster than wood. Other green features include linoleum made from a mixture of cork and recycled rubber, insulation that uses mulched newspaper mixed with flame-retardant material and 16 solar panels on the roof. "It was hard to find a builder to do this," Miller said. "people want to do things the way they've always done them." Turner estimated that the green practices and materials added about 10 percent to the cost of the home, although some of that is recouped through lower utility bills. "People are really interested in sustainable building," he said. "I've really gotten into it as a result of the demand."